PING www.google.com (74.125.131.147) 56(84) bytes of data. Some files I gathered from the system are in the thread's attachments. I'm using SystemRescue CD to setup the laptop. Included is also a complete history of commands (I didnt bother to remove redundancies or errors, but you can see sometimes I had to repeat stuff until it was right). I have experience with Gentoo (2005-2013-ish), but I'm new to funtoo. Did I miss something in the installation proceedure? I'm happy if someone was able to point me to the right direction. EDIT: ok, sorry about the confusion, but it wasn't a problem with the setup in general. What I forgot to do was add HDD/grub/grub.efi into the list of trusted boot sources in the BIOS. However, still I'm getting an error at boot time that it can't mount the root fs with btrfs. Coult not find the root block device in . I can happily report my problem is solved and the Laptop is booting now properly. So no issue with the boot or grub configuration was present, despite what I assumed. What I have noticed and what irritated me is the fact that I used the /proc/config.gz from my SystemRescue CD LiveCD which has full BTRFS support. However, my current kernel config from genkernel had BTRFS not even set, which is strange. So what I did is copy the config over from the LiveCD again, DON'T RUN "make oldconfig" and run straight genkernel --btrfs all to rebuild everything. Voila... it straight up boots. It was a mistake from me to not check it from the beginning because I was 100% confident if I use the same config, it couldnt possibly be different, right? Wrong! Anyhow you can never stop learning. Apparently both those articles recommend running "make oldconfig", but for me that was the reason why it wouldn't work. Did you emerge genkernel with USE="btrfs" ? Strange, I didnt notice it and I certainly didnt manually edit these files. I changed it but the same boot error message pops up, so it had no effect. In the meantime I emerged some microcode which I forgot, but even that doesn't make the difference. 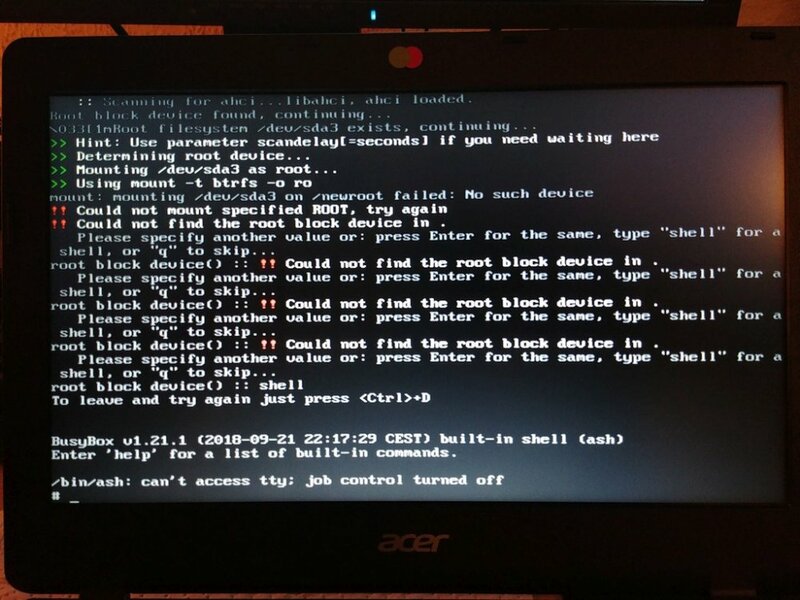 What I totally dont get is what boot.conf is supposed to do when I already have a grub.cfg. It seems redundant to me. Maybe someone can explain the differences? I had a problem similar to what you show in your screenshot. I.e. mounting /dev/sdxx ... no such device. Except in my case it was working with the debian kernel but not with my custom one. in the rescue shell ? It looks like your ssd isn't even recognized. So maybe a driver is missing. Probably the sata driver.